Persuasion is about inducing others to change their attitude or behavior. The seeds of persuasion must be planted in a fertile soil of compatibility with deep values and guiding principles of the persuadee to be able to grow into a tree with delicious fruits. Effect: Did the persuaded audience do what you wanted it to do? 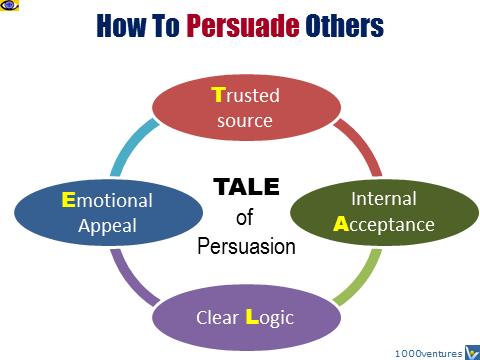 Persuasion is about getting people to want to do what you want them to do. "Good prototypes don't just communicate – they persuade," says Tom Kelly.4 Prototypes beat words and pictures. If a picture is worth a thousand words, then a good prototype is worth a thousand pictures. "It if easy to reject a dry report or a flat drawing. But models often surprise, making it easier to change your mind and accept new ideas. Or make hard choices, such as forgoing costly and complex features. Give your management team a report, and it's likely they won't be able to make a crisp decision. But a prototype is almost like a spokesperson for a particular point of view, crystallizing the group's feedback and keeping the things moving."